Setting up the affiliate promotion tools for your sites used to be a total pain... At Least Until Now! The problem is that most affiliates are lazy and if you don't provide them instant promotion tools then they will go to the next vendor and won't even check your product. Also many of affiliates are just newbies that won't know how to use the standard affiliate link Clcikbank provide them for your product. If you want to make it ridiculously easy for your affiliates and guarantee you make more sales then you have to give them a variety of material that they can use instantly and not just a single affiliate link to promote your product. With "Clickbank Promo Tools Generator" you can now create your dynamic affiliates promotion tools page in less than 2 minutes. When you use the software, just anwser a few questions, generate a single PHP file and simply upload it to your web server, then link to it on your main salespage and your download Page and make more sales by motivating people to join our affiliate program and use your instant promo tools. And, if that were not enough, if you purchase right now, I'm going to give you Master Resell Rights to this hot product, which will allow you to promote and sell this software to your friends, customers, email list or other Clickbank vendors and keep 100 of the profits from those sales deposited directly into your PayPal account. Take Action Now And Get This Great Tool To Motivate Your Affiliates and Increase Your Sales ! Think about this, for a measly $7.95 today you can be on your way to having your very own high traffic affiliate website. This is a small sum to pay, to start finally taking steps towards getting your affiliates start to work for you and motivate them to sell your products. This software is for use only on PCs running Microsoft Windows. The script requires a web host which supports PHP (No SQL database needed). P.S. Don't be fooled by the low price of this product. This small investment can bring wild return on investment. It can bring hundreds of hungry and motivated affiliates promoting your websites like crazy. 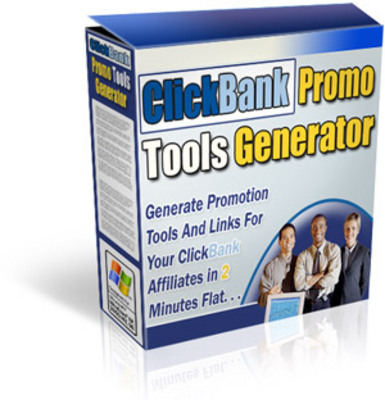 ClickBank Promo Tool Generator - powerful affiliate tool affiliate marketing software;affiliate marketing tool;clickbank money;clickbank promo tool generator 88290099 9.95 mystore Fresh Download Available!